Big A is going through a stage of begging me to bake him pineapple and sardines pizza for dinner. Pineapple and sardines? Where did he get that idea from? From a Disney Little Golden Book, that’s where. 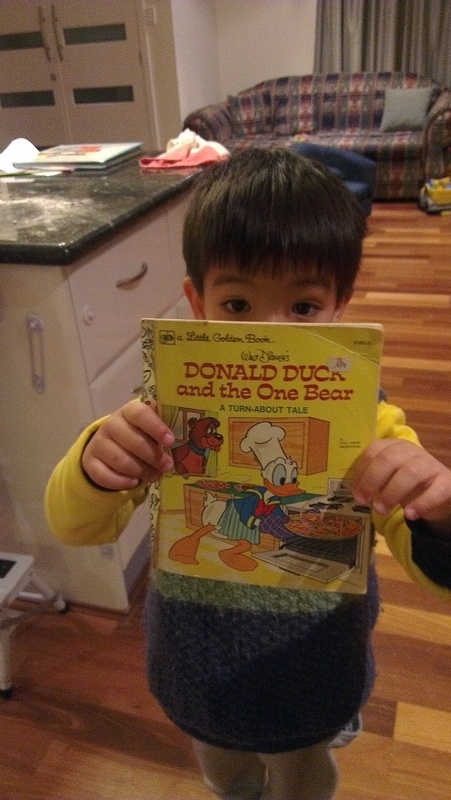 Specifically, Donald Duck and the One Bear, which is a story based on Goldilocks and the Three Bears. He loves this book. Every night he begs me to read it to him before he goes to bed, and then he goes to sleep with it under this pillow. At not quite five, he has memorized nearly all the words. I stop reading from time to time to give him an opportunity tell me the tale instead. Little A loves the book, too. He calls it “Donald Dook”, and they both laugh at his pronunciation as if it were one great big joke. 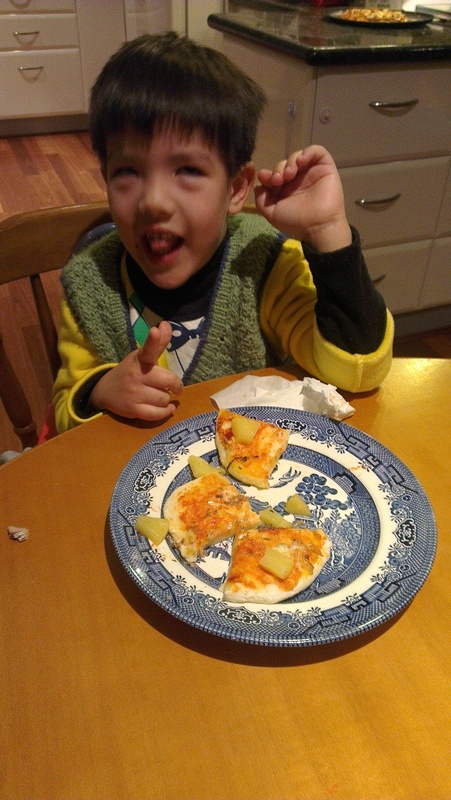 Big A asked me, begged me, pleaded with me to make him pineapple and sardines pizza. More than once. This pizza combination features in the book as the supposedly weird combination that only Donald Duck and the bear that wanders into his house and eats it all likes. It is meant to indicate a combination that is really icky. But actually, it is not too bad. And best of all — he likes it and actually eats it! Mainly just the sardines, though … he is not as keen on the pineapple. Taiwanese food often combines unusual salty/sweet flavours. A traditional soup, which I enjoyed in a teahouse in the Maokong mountains, is made from chicken, anchovies, bitter gourd and pineapple. I really like this soup. 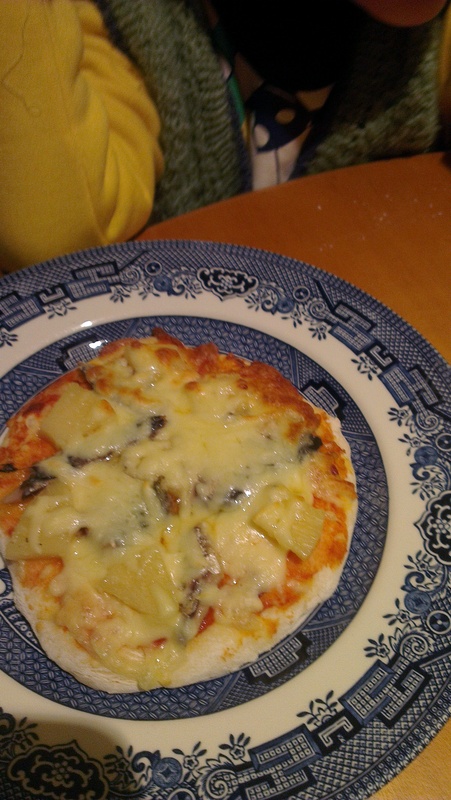 And so I also found myself liking the pineapple and sardines pizza, which is just as well because Big A (even when he likes something) doesn’t have a big appetite and there were plenty of leftovers for me. Of course, you could make the other pizza flavours featured in the book: a hot pepperoni pizza for Daisy or a cold sausage pizza for Huey, Dewy and Louie. Or else you could experiment with this. I usually make a double quantity of pizza, and if we don’t finish the pizza that night there is then an extra one for lunches or to freeze for another dinner midweek. Using a bread maker, combine the water and olive oil, and then add the dry ingredients adding the yeast last. Choose the ‘dough’ setting on the bread machine, and press start. If you don’t have a dough setting, choose one that will go for at least 30 minutes and allow time for resting afterwards of up to another 30 minutes. After the dough cycle has finished, remove the dough from the bread maker and place on a floured surface. 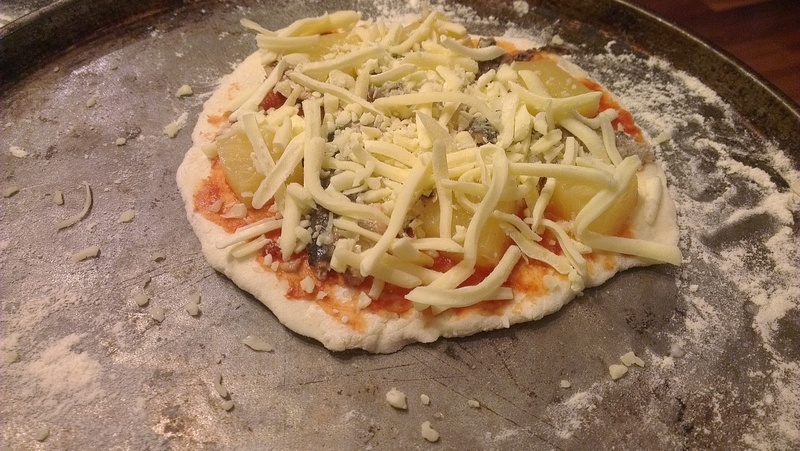 Roll out the pizza into a 30cm round (or make two smaller ones instead. Use a fork to prick some holes in the pastry. Then using a pastry brush, spread olive oil on the pizza base. Finally spread the tomato paste over the olive oil with a knife or spoon, pressing it close (but not quite up to) the edge of the pizza). Artfully arrange pies of sardines and pineapple chunks, then top with mozzarella cheese. Bake in a hot oven (around 200C) for 15 to 20 minutes. You can bake it on a marble slab or terracotta tile if you want to achieve a wood-fired oven like texture on the pizzas. I have a special pizza tray with holes that allows for ventilation. But whatever you do, nothing beats a piping hot pizza. Even Donald Duck’s favourite with pineapple and sardines!